Finishing is not my favorite part of woodworking but its sometimes a necessary step. Several years ago, Jim built this hall table. It has been moved around in several different locations but has landed here and is a perfect fit for this wall. Actually it was pretty cheerful and we happily lived with it for 6 or 7 years. While I enjoyed the color, it was time for a change. The folks at Kings United Church asked for two new signs for the church. One for beside the front doors (which Jim is working on) and another for the side of the church that faces the road. So we got to work on the largest sign first. Large sign for side of the church. Gina acquired a quilt stand from her mom today, it was built by her Uncle Burton many years ago. She wanted to paint it, along with the bathroom tissue cabinet I made years ago, so first thing to do is sand down all the parts. A woodworking friend, Bryan Cowing, made this cedar rocker for me a few years back. Its been parked on our covered porch since then. At the time I had put a couple of coats of clear wood finish. 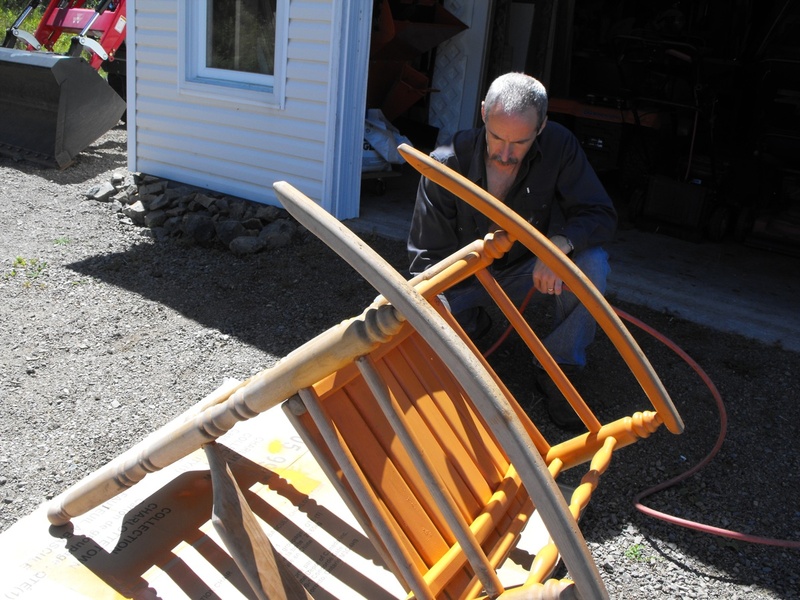 With the deck recently rebuilt, the idea came to refinish the rocker. This chair, and another just like it, came from my wife’s grandmother’s home. The cane is original. 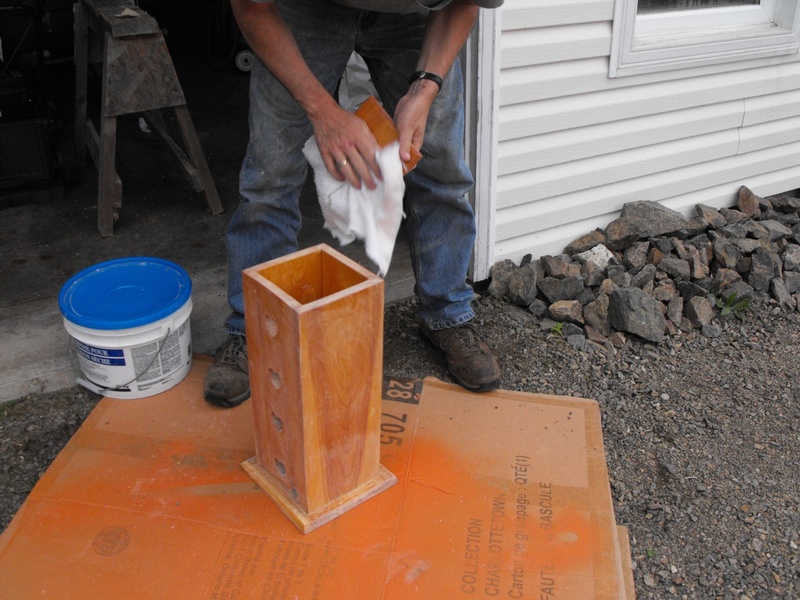 The other chair had six coats of various colored paints and an original coating that was orange-like in color. Factory maybe? It was the hardest layer to remove. I don’t know how old this chair is. Its in rough shape for sure but it has sentimental value to the owner, so its in the process of being refinished. Lots of hand work to do here. The owner doesn’t have a time schedule to have it refinished so we’ll get at it as time permits. This telephone came from my wife’s parents home. The card inside the unit is stamped as “Quality tested February 04, 1914” All I had to do with strip the old finish with furniture stripping gel and two coats of clear polyurethane.